Drain engine coolant. Refer to CO-8, "Draining". WARNING: Do not remove the radiator cap when the engine is hot. Serious burns could occur from high pressure coolant escaping from the radiator. Remove the generator. Rafer to CHG-20, "Removal and Installation". Engine coolant will leak from the cylinder block. 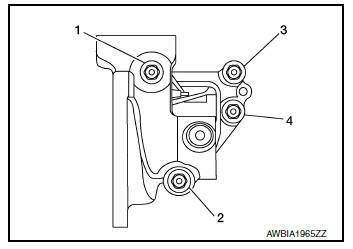 Tighten water pump bolts in sequence to specification. Tighten water pump housing bolts in sequence to specification. After installation, refill coolant and check for leaks. Refer to CO-9, "Refilling" and CO-8, "Inspection". Do not spill coolant in engine compartment. Use a shop cloth to absorb coolant. Do not reuse water pump gasket. Check visually that there is no significant dirt or rusting on water pump body and vane. Check that there is no looseness in vane shaft, and that it turns smoothly when rotated by hand. 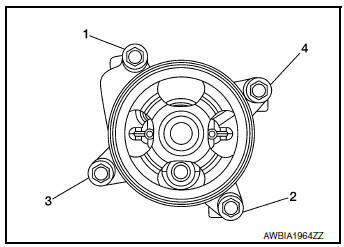 Replace water pump, if necessary. Check for leakage of engine coolant using the radiator cap tester adapter (commercial service tool) and the radiator cap tester (commercial service tool). Refer to CO-8, "Inspection". Start and warm up engine. Check visually that there is no leakage of engine coolant.